Winter in Belgrade is always fun and full of opportunities, especially in December and January. After crazy New Year’s Eve in our capital, you will find great day and night activities during festive weeks. 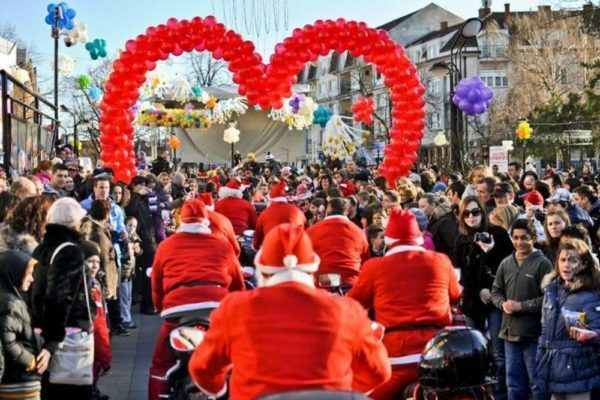 The 1st of January is reserved for charity event called “Ulica otvorenog srca” (translation: “Street of the open heart”). You will find hand made souvenirs, great fast food and beverages. This January will be more popular then ever, reason is the European Water Polo Championship (held from 10th to 23rd of January). Lovers of Water Polo are going to take over the city during this period. Apparently, for the first time, 16 national teams will be competing in men’s and 12 teams in women’s category. The audience in “Arena” will have the opportunity to enjoy even 100 games – 56 men’s and 44 women’s matches. Serbia is an Orthodox Christian country and therefore, we celebrate New Year’s Eve and Christmas by Gregorian calendar. Orthodox Christmas Eve is on 6th of January, and Christmas is on a next day. People are spending Christmas Eve with their friends and family, and traditionally after dinner, all together go to the church to welcome Christmas at midnight. 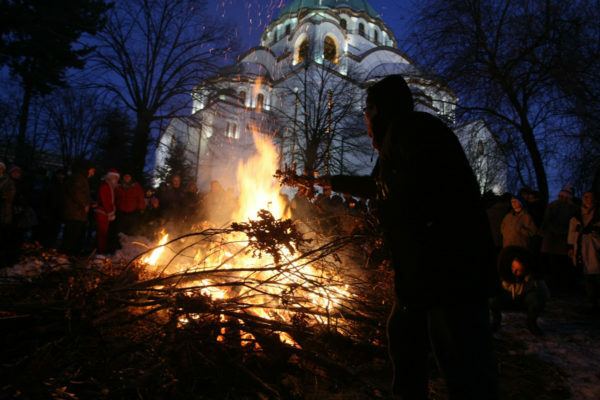 And than, an Orthodox priest places Badnjak on the fire during Christmas Eve celebration exactly at midnight. The Badnjak is an oak log or branch brought into the house and placed on the fire on the evening of Christmas Eve, much like a yule log in other European traditions. Also known as Serbian New Year’s Eve, celebration is held on 13th of January. All the best clubs in Belgrade are opened and welcoming party people to join celebration. Before celebrating, we suggest you to start your night in pubs or some good restaurants. The most popular area for warm up is called Skadarlija. It is a Bohemian quarter of Belgrade, and if you are visiting for the first time, this is a must location. One of the most popular restaurants is “Tri Sesira” (Translation: 3 Hats). The Tri sesira restaurant is one of those places that a true hedonist just can’t pass. Great cuisine, extraordinary wine, unique ambiance, traditional music in the shade of cascading flowers and linden trees, excellent service, history and culture, renowned guests – all wrapped in one – one of the best experiences Belgrade has to offer. People normally warm up with mulled wine or a boiled Rakija (strong and traditional Serbian beverage) with a good dinner or quick bite, and then head to the clubs. Good to know: parties start around 10 pm for the New years EVE. Reservations for pubs, restaurants and clubs are a must, especially for NYE. WhatsApp us for more info and reservation on time: +381 62 33 77 00. If you want to mingle with locals, then concerts on Squares around the city are perfect solution. Also, on the plateau of Slavija Square for New Year’s holidays will be organized screenings of feature and documentary films om the open air. All museums, theaters are open as well, so a little bit of culture is a great option as well. Try ice skating in Belgrade! There are many open air and closed ice skating halls in Belgrade. Maybe the most interesting one is on Nikola Pasic Square in the center of the city.